Opera artist Gao Bao Jun applies his makeup before greeting the audience in character for another performance in the village of Beiyan, Shanxi. 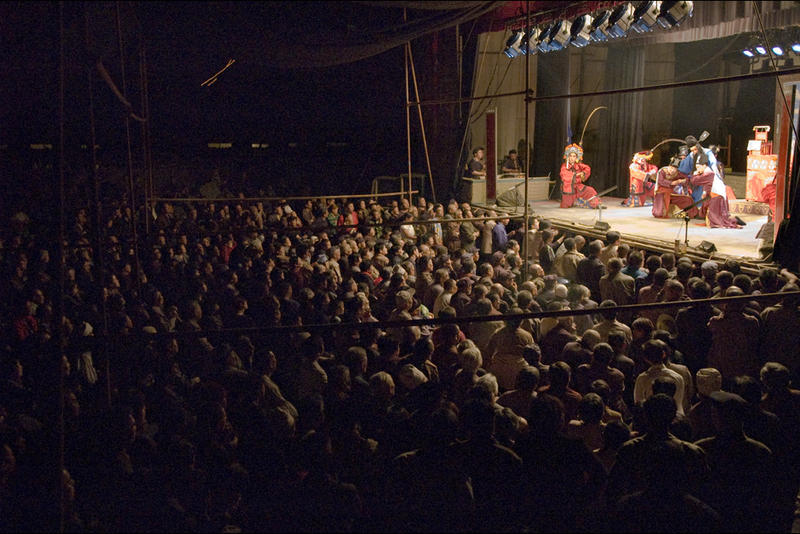 Erected on the edge of a village, the performance stage stands in a field cleared of the year’s crop of corn. The troupe has settled in for two days of performances here in the mountains of Xiyang County, Shanxi. 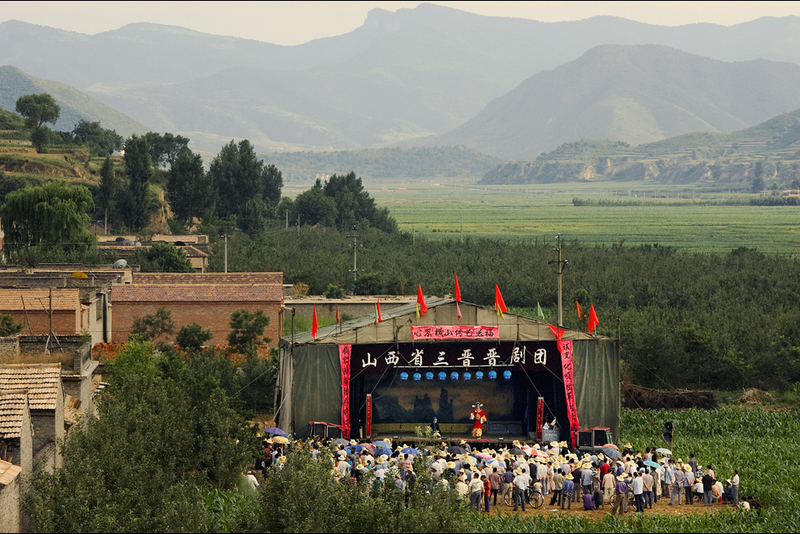 The lead singer is from this village, so the troupe has offered to perform for free. Otherwise, the villagers here likely would not be able to afford such a prominent troupe. 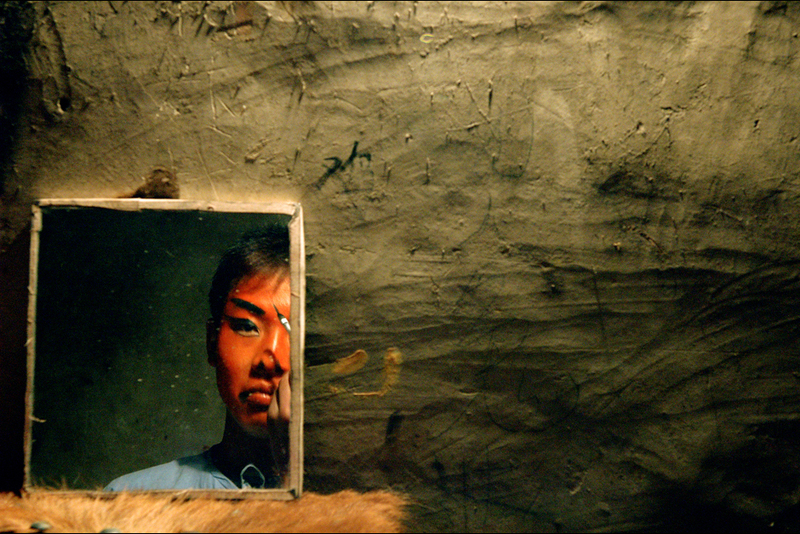 Gao Bao Jun joined the opera troupe at the age of sixteen. According to local custom, he will need to support his family, so after two years he will leave the troupe for a job in Xi’an in search of a higher salary. 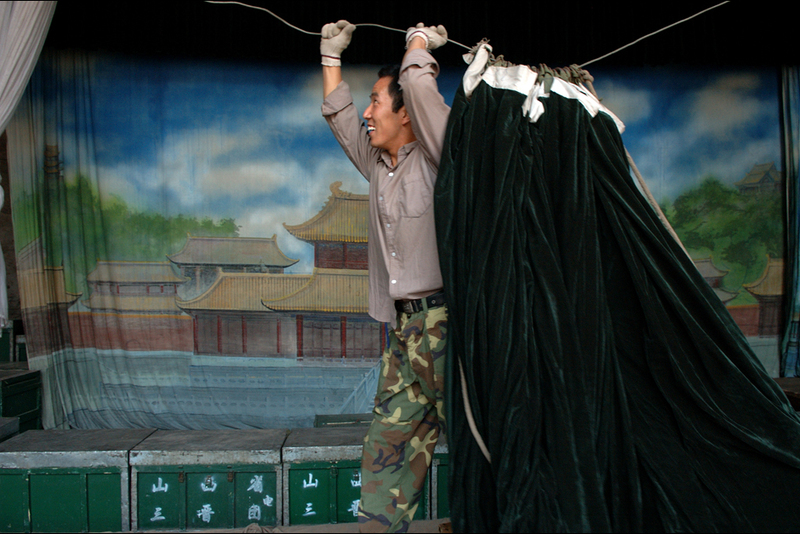 The low pay, perhaps more than any other hardship, is to blame for the loss of China’s traveling opera tradition. 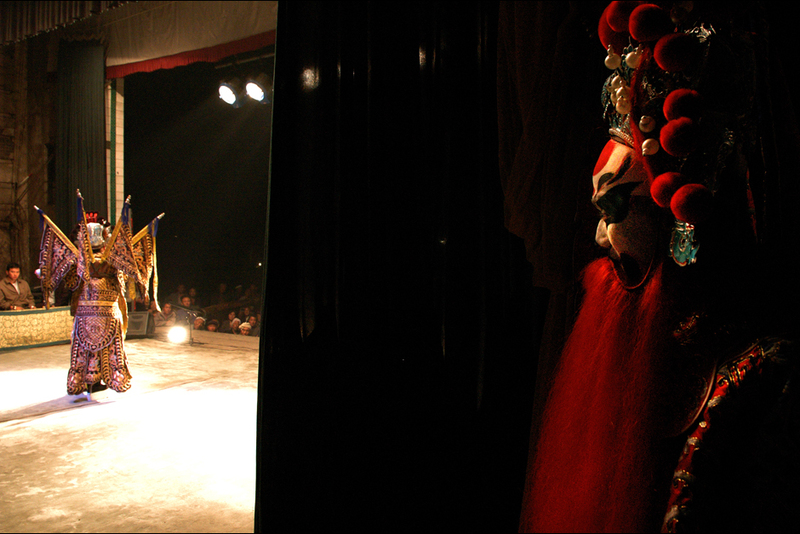 A Sanjin performer watches from offstage awaiting his entrance. Many of the performers enter this life at an early age—a life full of long travel, financial hardship, and few amenities. Their audiences are rarely aware of their lives off-stage and and expect the same high-quality and entertaining performance every time. In a packed audience, children sit on adults’ shoulders for a better view. 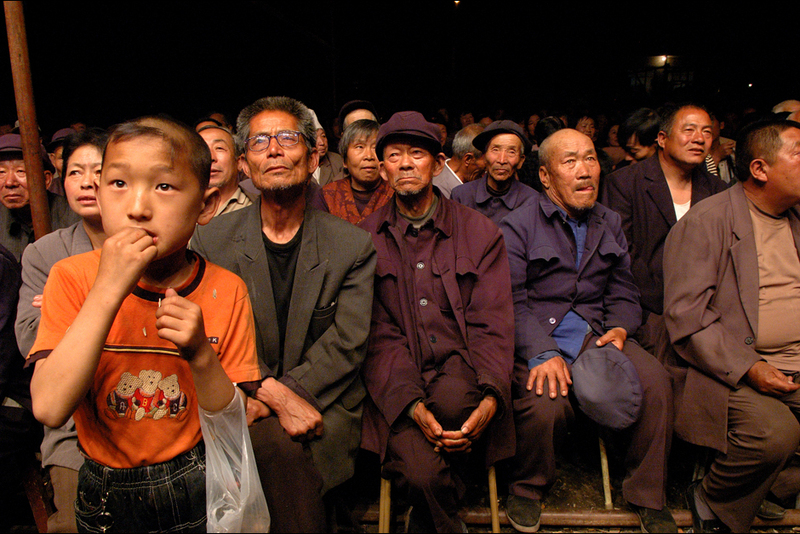 Children and the elderly make up most of the audience for these traveling opera performances. Young adults have largely turned away from traditional Chinese opera, as few appreciate the subtleties of this difficult-to-understand art form. Piles of coal serve as box seats for the overflow audience as moonlight mixes with the warm glow of stage lighting during an evening performance. 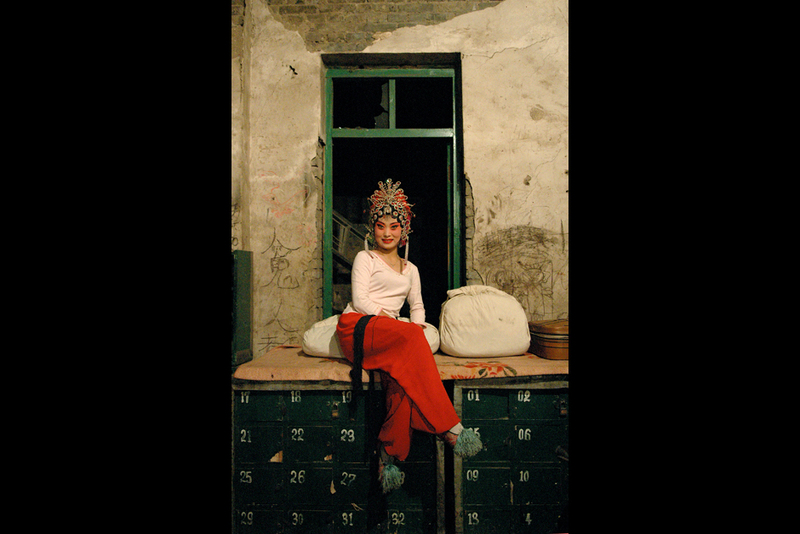 Shanxi is a coal-rich region, and the owner of the troupe owns a coal mine. Profits from this venture provided the resources to found the troupe. 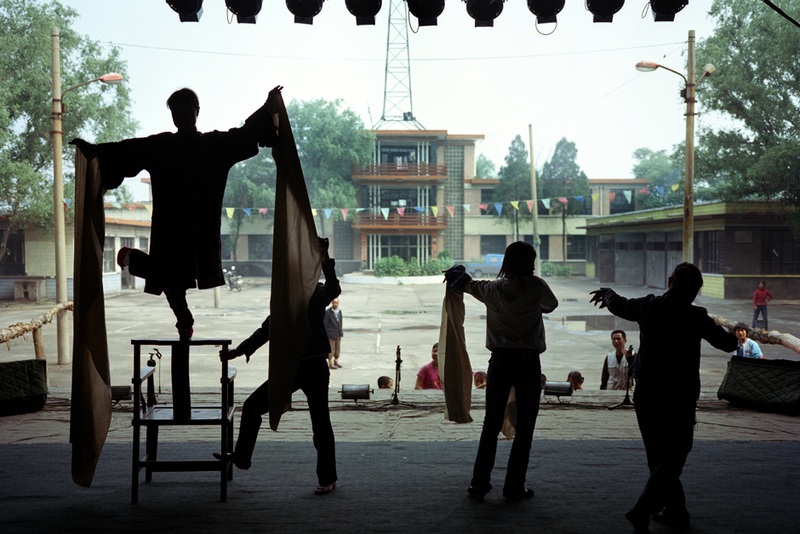 Backstage after a matinee performance, Guo Shenghai and Qin (with black headband) horse around during the few hours before the more popular evening performance begins. Despite the levity, Qin’s past is marked with sorrow: After ten years with the troupe, he left, but then lost his life savings in a pyramid scheme. His friends in the troupe loaned Qin money for train fare so he could join them on the road again. 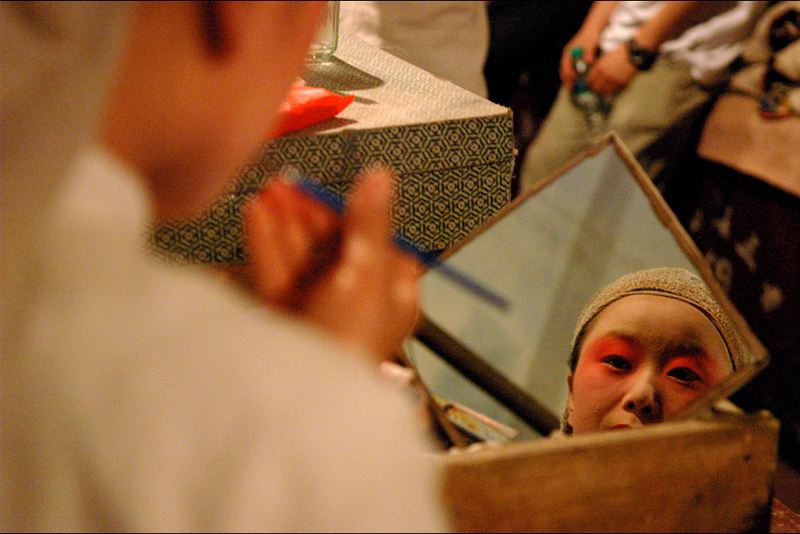 Performers stay in makeup during the short breaks between shows. Qin dries himself off after showering in a public bath. This is a rare luxury, as often the baths are closed by the time the evening curtain has dropped. Another morning begins with Tianjun and Qin waking up after spending a night on thin mats rolled out on the floor. Their day usually starts at six o’clock in the morning and finishes around midnight. 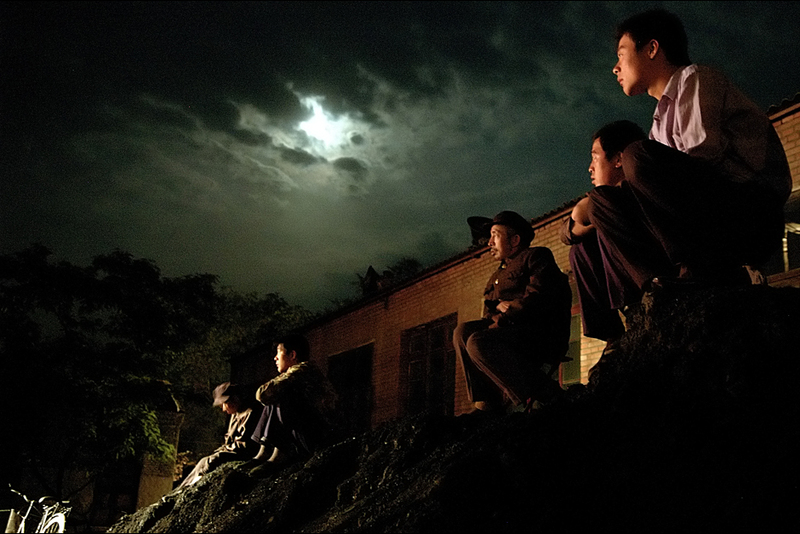 When they are not sleeping in municipal buildings lent to them by village committees, troupe members can sometimes pay villagers in coal in exchange for a place to rest for the night. Rehearsal time: members of the Sanjin troupe rehearse a difficult scene in the morning, before the plaza fills with another audience ready to see the evening’s performance. The troupe’s equipment fills a truck that follows it everywhere, and at each stop crew members must set up the stage. Sometimes they only have a few short hours before the curtain rises for the first performance, so the entire company helps get the stage ready. 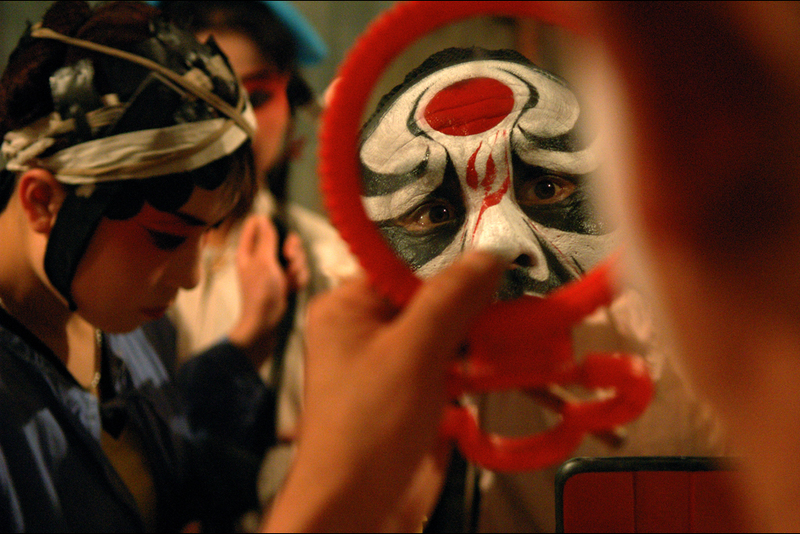 The makeup application process is difficult and time-consuming, but key to the art of Chinese opera. It takes years for artists to learn the skill. The makeup’s colors and markings enable the audience to quickly identify a character as good or bad, as well as his or her function and rank. Lead singer Yang Xiaojuan poses for the photographer. Asleep while in motion, performers stretch out on a bus bound for the next destination, four hours away. 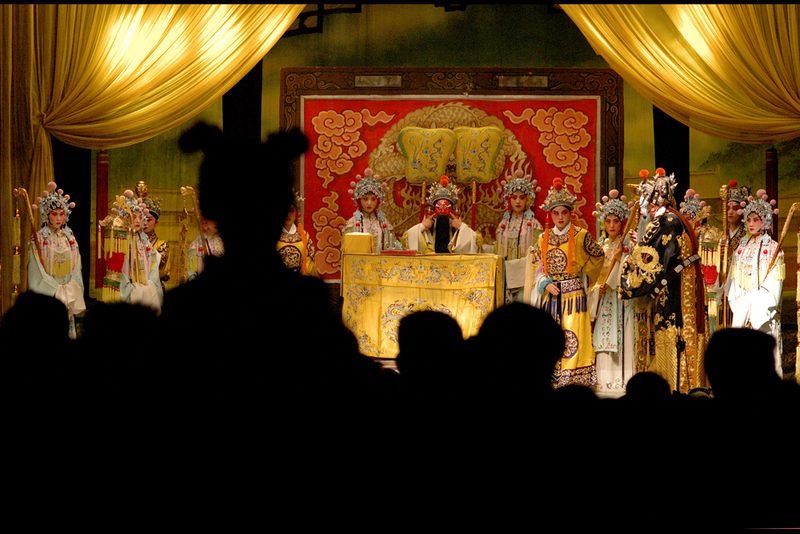 They rarely travel beyond the borders of Shanxi, as their style of opera is specific to the region. Nevertheless, the distances are long and most troupe members only see their families once a year, during the Spring Festival. 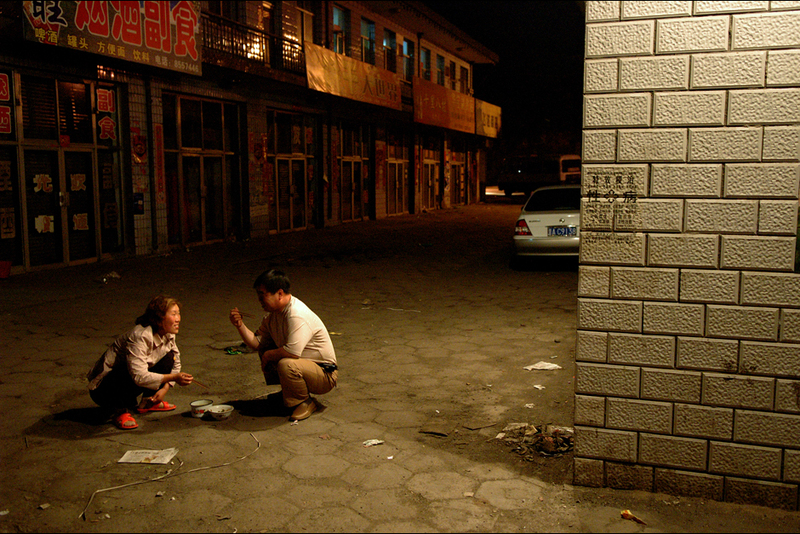 Ninteen-year-old Guo Shenghai chats with a girlfriend during a play. 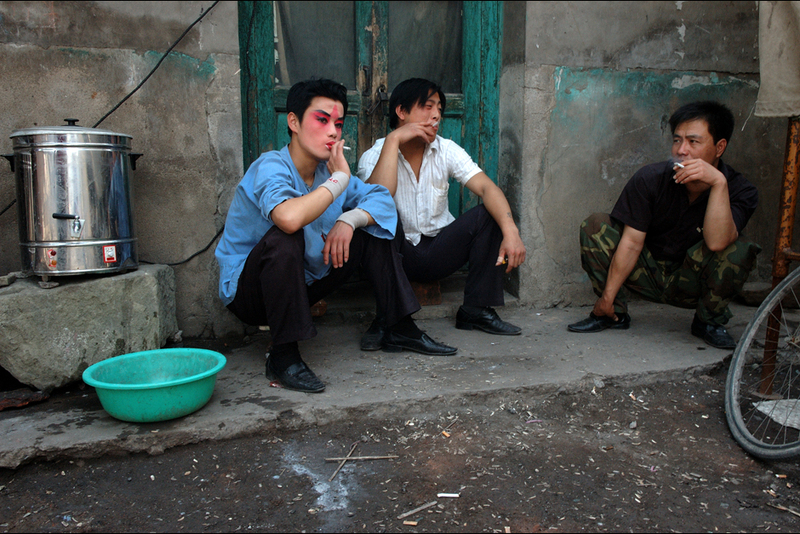 The shows usually last three to four hours, and the performers must pass the time in between in makeup. Guo joined the troupe when he was fifteen. Coming from a farmer’s family, he discovered opera at the age of eight when a traveling troupe came to his village. Fascinated by the mix of colors, music, and martial arts, he soon joined an opera school. He now mostly plays the role of a soldier, a role that allow him to display his skills at kung fu. The colors used in Jinju opera are rich in symbolism. A red face speaks of dignity and loyalty; a black face indicates honesty and toughness of character; a blue face is associated with bandits or Robin Hood types; a golden face is reserved for a deity or the supernatural; and traitors are identified by their white faces. Characters dressed in white gowns, known as kao, conventionally play young generals in Jinju opera. 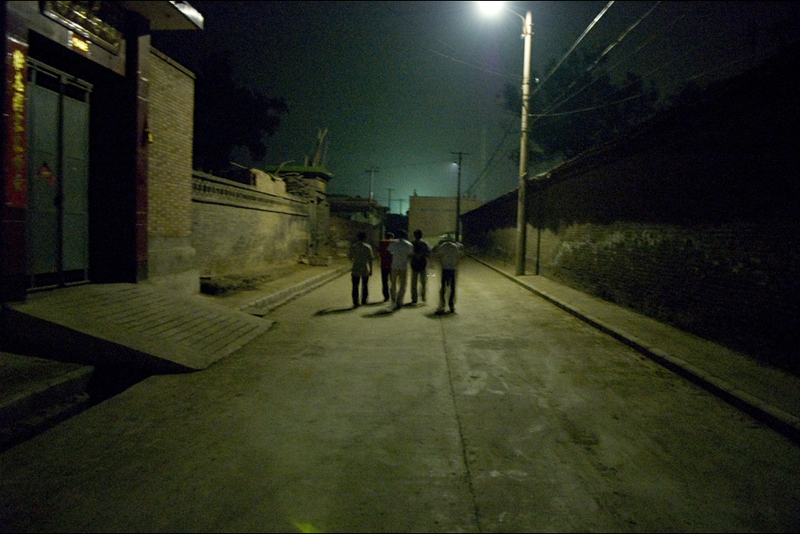 Friends and performers walk through empty streets late at night in the village. Without their costumes and makeup, these generals, heroes, traitors, and villains retreat into the darkness, only to perform again the following day. Seven days a week eight hours a day, the members of the Sanjin Shanxi Opera Troupe impersonate princes, generals, and emperors. 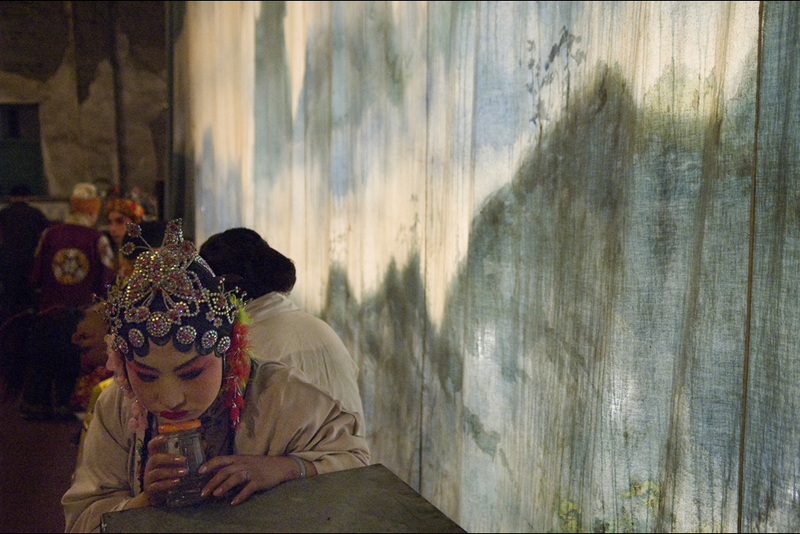 These performers are keeping alive one of China’s oldest traditions: its opera. 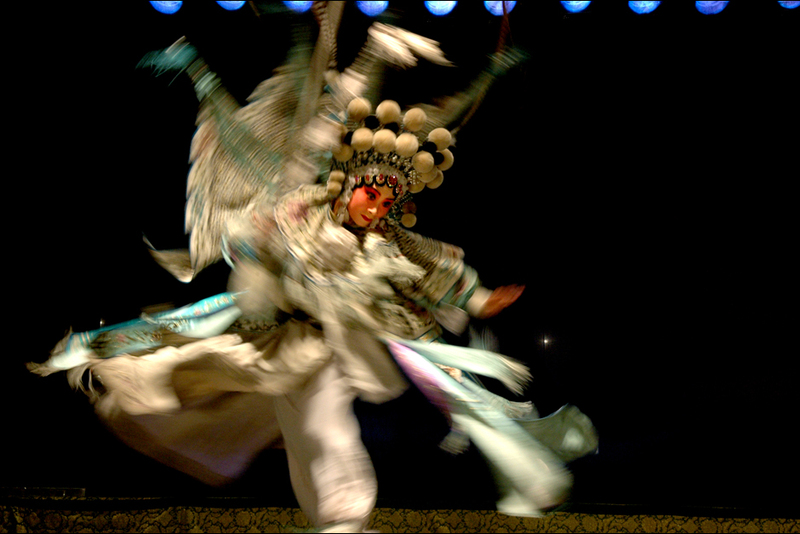 Almost every region of the country has its own style of traditional opera; the Sanjin troupe performs Jinju, or Shanxi-style opera, which developed in the north China province where its members work. 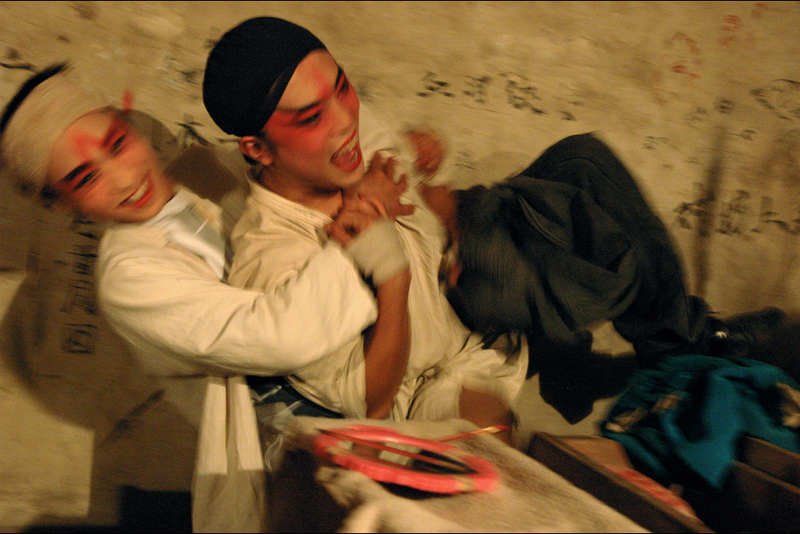 In conditions that range from scorching heat to freezing cold, Sanjin’s actors sing, dance, and mime stories of love, treason, and wars in front of mesmerized audiences. They move among Shanxi’s cities and villages throughout the year, bringing with them a dream of ancient and long-vanished China. After performances, the actors shed their shiny and colorful costumes and live humbly, sleeping and eating on the floor, trying to make do with the meager earnings of their carefully honed art.